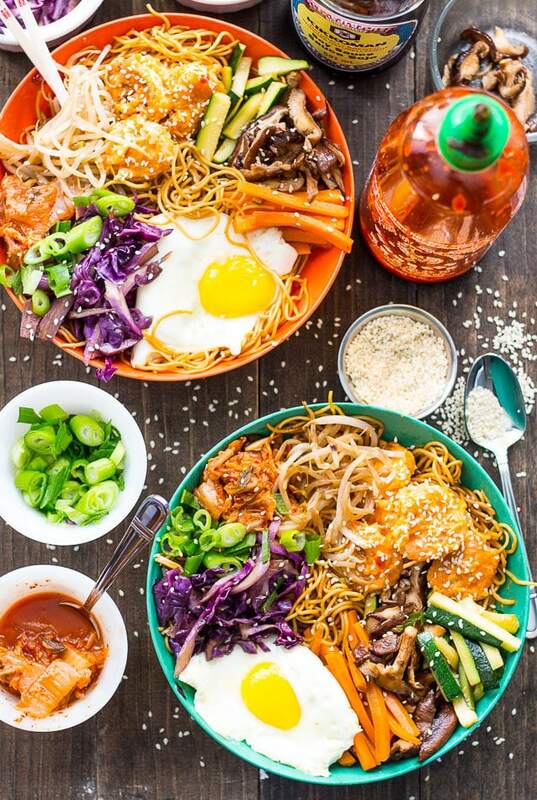 These Bang Bang Shrimp Bibimbap Noodle Bowls are filled with sweet, crunchy chili-garlic shrimp, a fried egg, kimchi and lots of sesame flavoured toppings! Get ready for some over-the-top, mouthwatering flavour everybody!!! 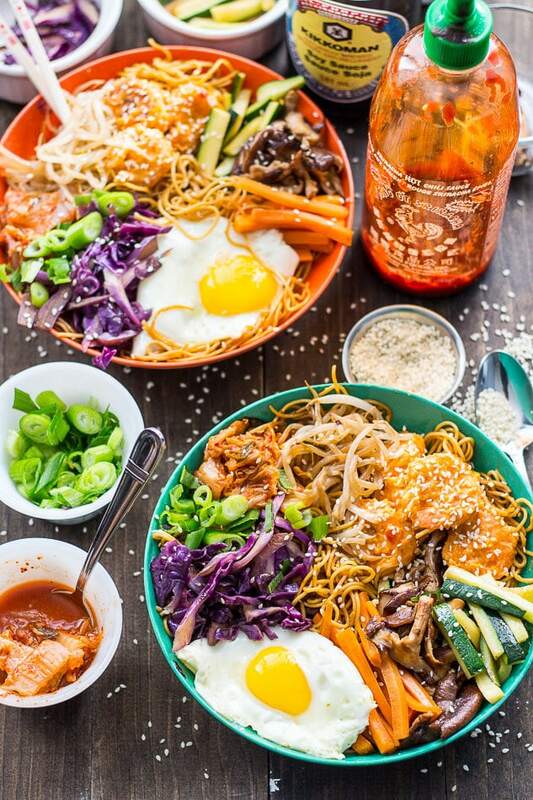 These Bang Bang Shrimp Bibimbap Noodle Bowls are the next best thing you'll put on your dinner table. And they literally combine ALL of my favourite food groups. Like bibimbap, or bang bang shrimp, or stir fried noodles, for instance. Ahh, my love affair with Bibimbap. It is the most popular and most visited recipe on my blog, and it is one of the first internationally-inspired recipes that I've created with a fair amount of success. And I never even tried the dish until I was almost in my mid-20s if you can believe it! I still remember the day at a sushi restaurant of all places. Did you know that most of the sushi restaurants in Toronto are actually owned and operated by people of Korean descent, and not Japanese? Probably one of the best things to come out of this is the fact that many sushi restaurants (at least in my area) offer things like bibimbap, bulgogi beef and other rice bowls on the menu alongside some of my favourite sushi rolls. 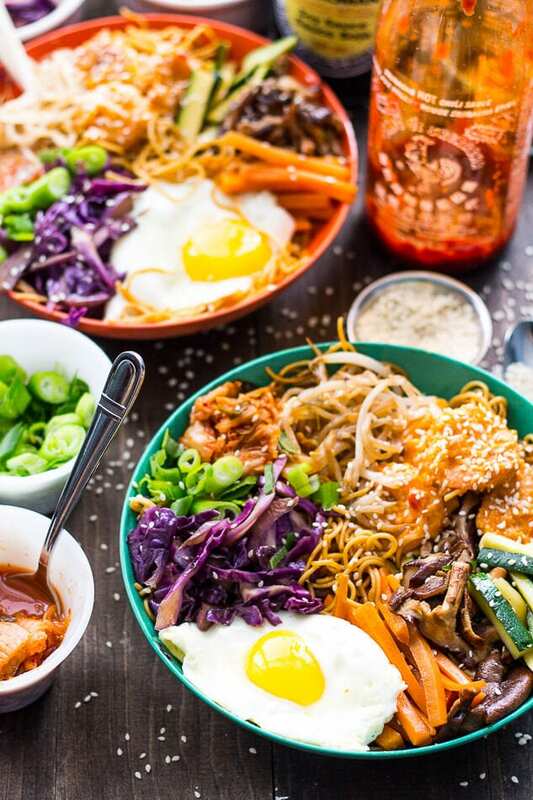 My roommate ordered a bibimbap bowl a couple years ago, and I was very curious – I had always seen them on the menu but never bothered to venture outside of my usual order. I'm really into ordering the same thing at my favourite restaurants btw. Am I the only one that does this? Well, needless to say, this girl sometimes needs to do a better job at getting out of her comfort zone because as soon as I tried a bite of my roomie's bibimbap, I WAS HOOKED. There was just something about the way the fried egg blended with the savoury, soy-sauce laden rice and crunchy, sesame-flavoured veggies. It was like Chinese takeout on a whole other level, and the flavours seemed so simple, yet genius. Since that day, I have recreated bibimbap in some form or another several times, and though it can be a process stir frying the veggies one at a time, I appreciate that these kinds of bowls are so versatile and easy to replicate, with only a handful of different sauces needed. You probably have most of 'em in your fridge. Technically you're supposed to use beef and season it with gochujang, a fermented Korean condiment made from red chili (you should be able to find it at Asian or international grocery stores), but I felt the need to switch things up here. I mean, I've neglected to emphasize perhaps the best part of these bowls. 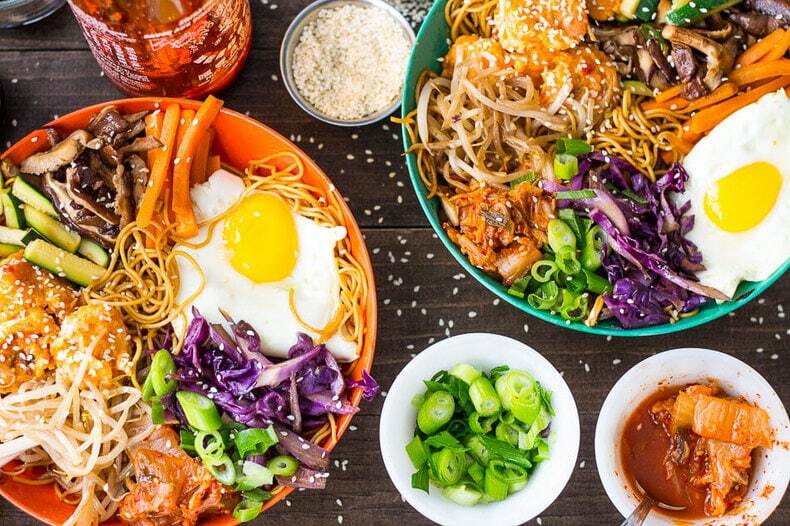 I don't even think I need to tell you how delicious and over-the-top these bowls are. I'm probably gonna put them on my meal plan again for this week, that's how in love I am. But just look at these bowls though!!! 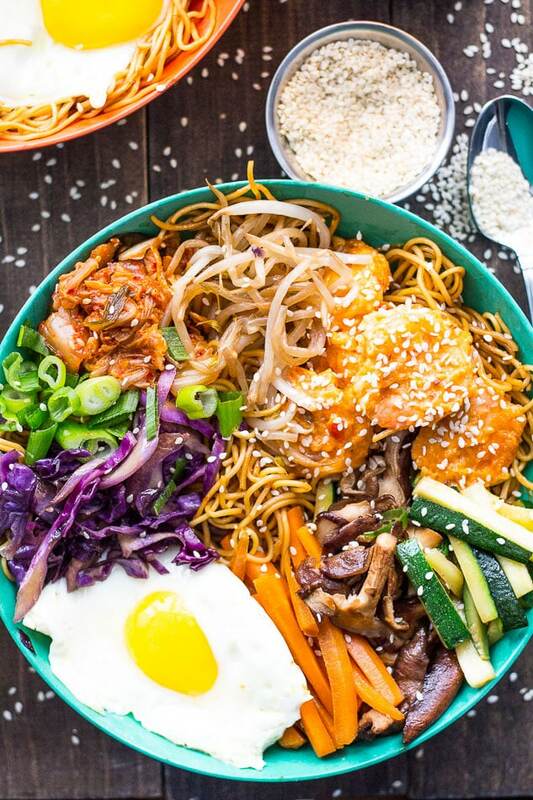 Will you be making these Bang Bang Shrimp Bibimbap Noodle Bowls? If you try any of my recipes be sure to let me know on Instagram, Twitter, Facebook or in the comments – I'd love to see what you come up with! I love these stir fry noodles in this recipe if you're looking for something similar to what I used! In a medium-sized frying pan, heat 1 tsp sesame oil over med-high heat. Add each of the veggies (zucchini, carrots, mushrooms, cabbage and bean sprouts) and 1 tsp soy sauce one at a time, cooking for 2-3 min until softened. For instance, you will stir fry the zucchini for a couple minutes, then place separately in a small bowl and continue these steps with all veggies listed until each is cooked. Meanwhile, mix light mayo, sweet chili sauce and sriracha together. Set aside as the Bang Bang sauce. Heat 2-3 tbsp olive oil in a large frying pan over med-high heat. Deglaze large frying pan, then add 1 tbsp olive oil and 1 tsp sesame oil. Add garlic and saute for 10 seconds over med-high heat. Add noodles, remaining soy sauce (should be a couple tbsp), sriracha, and water, stir frying for 5-7 min until noodles are softened. 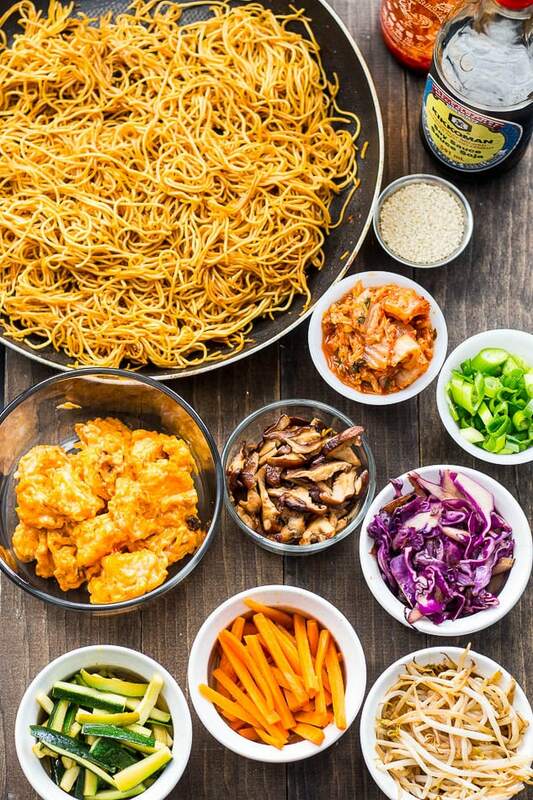 Divide evenly noodles among bowls. Add 1 tbsp olive oil to the large frying pan and fry the 4 eggs over med-low heat, carefully ensuring that they don't overcook. When yolk is still mildly runny, remove from heat and place on top of noodles. Add about 1/4 cup veggies (or about a handful) to each bowl, including kimchi and green onions. Sprinkle with sesame seeds and serve with sriracha. Enjoy! I am loving the flavours in this recipe! I am definitely putting this down on my list of meals to make in the future! Your dish is full of exciting flavors and textures! LOVE it. Wow! What a flavour combo! It sounds totally mouthwatering! You’ve just won the award for the most beautiful dish in the world! This is so stunning that even my veggie-hating boyfriend would gobble it up. Pinning! 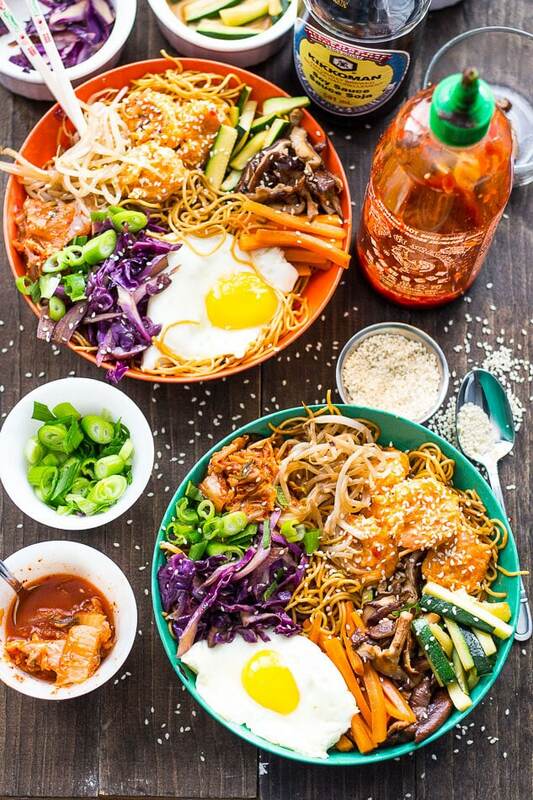 Oh my goodness, I wish we were having these Bang Bang Shrimp Bibimbap Noodle Bowls for dinner tonight! We’ll definitely be having them soon, Taylor! What a wonderful way to get lots of nutrition and lots of flavour in a comforting meal. And I didn’t know that about Toronto sushi restaurants!! The clarity and sharpness in your photos is next level! That alone and the beautiful arrangement of it all makes me want to dive into these bowls mouth first!!!! I have two funny things… Our Japanese restaurant in town is owned by Mexican people and actually serve Chinese food LOL! But we are small town. I love bang bang shrimp but still can’t pronounce the name of these bowls. Won’t stop me from eating them though!! Omg yumminess! Thank u! I’m also trying ur honeydew recipe for breakfast tomorrow! Made this tonight. Amazing! Love Korean food so I knew these would be a big hit. Can’t wait to try more of your reciepes. Dynamite Shrimp jars is next! That makes me so happy to hear Nisha!!! Thanks so much for sharing with me <3 I hope you like the jars too!